Product prices and availability are accurate as of 2019-04-19 02:54:51 UTC and are subject to change. Any price and availability information displayed on http://www.amazon.com/ at the time of purchase will apply to the purchase of this product. Claire Danes's performance as an off-the-rails federal agent may be the best thing about Homeland, but it's certainly not the only thing to admire about a show that's the visual equivalent of a page-turner (and the recipient of 2012 Emmy Awards for Best Drama Series and Best Actor and Actress in a Drama Series). The focus here is on the specter of domestic terrorism. When Marine Sgt. 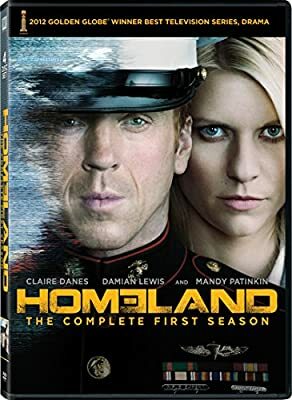 Nicholas Brody (Damian Lewis), missing and presumed dead for some eight years, is found disheveled, disoriented, and alive in Iraq, he's regarded as a hero back in the States. But Agent Carrie Mathison (Danes) isn't so sure; in fact, she's convinced that Brody was "turned" by the notorious, bin Laden-like terrorist leader Abu Nazir, and is now part of an ambitious scheme to kill Americans on their own soil. The fact that she has no proof and precious little support within the CIA--only mentor Saul Berenson (Mandy Patinkin) and a couple of others give the slightest credence to her theory--hardly deters Mathison. She's persistent, to say the least. But she's also obsessive, unstable (bipolar, to be precise), and reckless, all too willing to do things illegally and prone to making choices throughout the season that put herself and those around her in serious jeopardy, both physically and psychologically. Brody, meanwhile, has a tough time readjusting to normal life, what with the obnoxious glare of the media spotlight and the awkwardness of the reunion with his family, including wife Jessica (Morena Baccarin, very different from her role as the icy alien leader in V) and their two kids.